An exemplary film from auteur director and writer Xu Haofeng (based on his own novel), who seems to be redefining the Mainland Chinese martial arts film. This may be his most extravagant production in terms of ravishing colonial set design and costume, but it is still a strikingly singular and taut vision. Xu’s knack for zingy dialogue and rounded characters extends to his signature fight scenes; realistic, organic, with stark sound effects, and grounded in humanity and authenticity. It’s a unique approach which weaves seamlessly into the film’s sharp narrative. The premise may seem familiar in terms of chopsocky tropes, but given fresh complexity under Xu’s guidance. Set in the 1930s, it charts the attempts of Master Chen (Liao Fan) to set up a Wing Chun school in Tianjin, a famed hotbed of northern martial arts styles and home to a conglomerate of dojos who act almost autonomously. This exclusive, closed community is portrayed more like a crime syndicate, led by a powerful, androgynous sifu (Jiang Wenli), who rule with intimidation and exclusivity, refusing to expand their teachings onto the wider society. Chen has other ideas and wants to spread the teachings of the relatively new, southern Wing Chun style far and wide, but in order to obtain his own school, he must train a disciple worthy enough to defeat eight of the 19 established dojos. Conformity, tradition and modernisation are key themes in the film. Chen must act in accordance with the unwritten laws of the martial world as a means of showing respect, just as their staid traditions are put under threat by a growing military presence in the lead-up to the war and China’s integration with the wider world. Chen’s wife (Song Jia) is also shown to be a victim of societal constraints; she is shamed due to an early pregnancy and lives a life of marginalised despair in the shadow of her husband. In a refreshing twist, the kung fu masters – Chen included – are shown to be manipulative, corrupt and selfish, acting for their own gain and legacy. The action scenes promote skill over violence, and Chen never fights to kill. Even his barnstorming weapons duel towards the end with Tianjin’s top masters in an alleyway – an ideal location to focus on the close-combat intricacies of Wing Chun weaponry – is presented with a methodical, chambara-like efficiency, exemplify the intelligence in every movement. This means when the film does eventually step into more violent territory, it is all the more powerful. The film is also funny, with some ludicrously big weapons, deadpan delivery and great reaction shots. There’s a lot going on here; a real feast of a film. 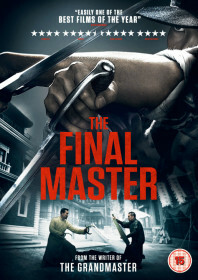 The Final Master is released on Blu-ray, DVD and digital download in the UK via Cine Asia on 19 February 2018. Buy now on Amazon.